If you are itching to see some of the new cars from Lexus, Rolls Royce, Mercedes-Benz, GMC, Lamborghini, Maserati and other fast cars at the 2011 Chicago Auto Show, you in luck! From Acura to Volvo the floor of the Chicago Auto Show is littered with $50,000-plus luxury cars that bathe occupants in sumptuous leather and burled walnut and coddle with creature comforts like heated and cooled cup holders and massaging seats. You can find the following concept cars on display at the 2011 Chicago Auto Show or at the Vehicles on Display section of the auto show Web site. To receive your free pair of tickets,click on the link below. Print your confirmation page and bring it to your participating Chicagoland & Northwest Indiana Chevy Dealer. If you don’t have access to a printer at the time of registration, you can print your confirmation email. Right now, you can get free tickets byclicking here. I did this yesterday and didn’t get FREE tickets. The chevy dealership gave me tickets for $4 off weekday price 🙁 Very disappointed! What a great way to spend a day with my sons and daughter….could really use some free fun for the kids! My teenage son loves cars and has never been to an auto show. It would be fun to take him. My fiancé and I go every year, and are excited to take our son to see all of the cars. I printed my confirmation & took it to a local Chevy dealer who told me that they were all out of free tickets! What gives? This is bogus! What a GREAT way to spend some time with the kids!! 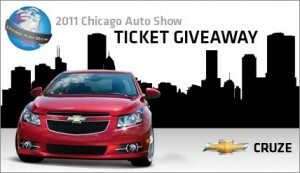 Free Auto Show Tickets PlEASE!!! i plan on taking my son to the show. He needs my car and I need a new one! Went Yesterday to one of the dealership giving out the free tickets and was disappointed. I had my confirmation sheet and gave it to the gentle and in return they gave me a DISCOUNT COUPON TICKET. I believe thats false advertisement, i knew it was to good to be true. the people on here that are putting the posts should really take some time and get the details right. My son and I have gone for several years now and would love to continue the tradition. Free tickets would be great. This is my first time attending the Auto Show and i am super excited!!! Looking forward to my 1st time at the auto show. can’t wait to see all the new cars!! did this work for free tickets? Would love to take my mom to the auto show.